Perfect for dual sport bikes that get ridden primarily offroad, this is the smallest, lightest foldable mirror Baja Designs offers. 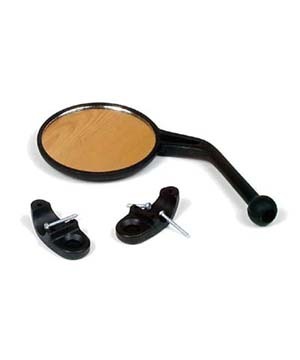 It satisfies the law's mirror requirement and still easily folds down over the handlebars without any tools. It comes with it's own 2-piece clamp mount and is side-specific. Note that because of its small size, its actual rear view capabilities are fairly limited. if you're looking for a larger, more road functional mirror.